Security researchers have developed a Flying Drone with a custom-made tracking tool capable of sniffing out data from the devices connected to the Internet – better known as the Internet-of-things. Under its Internet of Things Map Project, a team of security researchers at the Texas-based firm Praetorian wanted to create a searchable database that will be the Shodan search engine for SCADA devices. 2 How did They locate Internet of Things Devices? To make it possible, the researchers devised a drone with their custom built connected-device tracking appliance and flew it over Austin, Texas in real time. 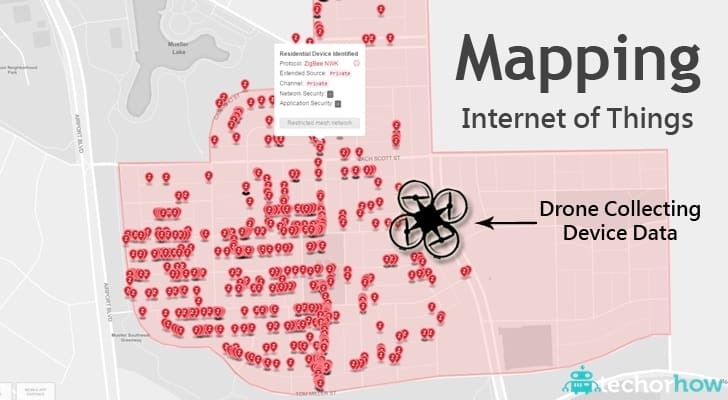 During an 18 minute flight, the drone found nearly 1,600 Internet-connected devices, of which 453 IoT devices are made by Sony and 110 by Philips. You can see the full Austin map here. How did They locate Internet of Things Devices? The researchers located all ZigBee-enabled smart devices and networks and then started expanding their research. “When [IoT devices] communicated over a wireless protocol called ZigBee, this protocol is open at a network level. So when the devices start connecting, they send out beacon requests. We capture data based on this,” says Paul West Jauregui, from Praetorian. ZigBee is a popular smart-home wireless communication standard used by the majority of Internet of Things (IoT) devices today. ZigBee protocol, which lets IoT devices talk to each other, is implemented by major vendors including Toshiba, Philips, Huawei, Sony, Siemens, Samsung, Motorola, and many more. …that’s Evil! But it has been demonstrated by a Vienna-based team of security researchers at Black Hat security conference. Tobias Zillner and Sebastian Strobl from ‘Cognosec’ have discovered some critical security flaws in ZigBee that could allow hackers to compromise ZigBee networks and take over control of all connected devices on a network, including door locks, alarm system and even controlling your light bulbs. The vulnerability actually relies in the way ZigBee protocol handles the keys it uses to authenticate the IoT devices it adds to its mesh network, allowing hackers to sniff out exchange authenticate keys. “Tests with light bulbs, temperature sensors, motion sensors and even door locks have shown that the vendors of the tested devices implemented [minimum features] required to be certified,”says Zillner. The worse part pointed out by the researcher is that there is nothing users could do to make their smart devices more secure, and since the flaw affects a broad range of devices, it’s quite unclear how quickly vendors will come up with a fix.